This is our building! It's short in the front, long in the back. A great mullet for happy hackers! Currently this is the sixth iteration of Vancouver Hack Space, and one of the largest we've been able to inhabit so far. We're truly excited for all the great projects we can get started on now that we have this building. 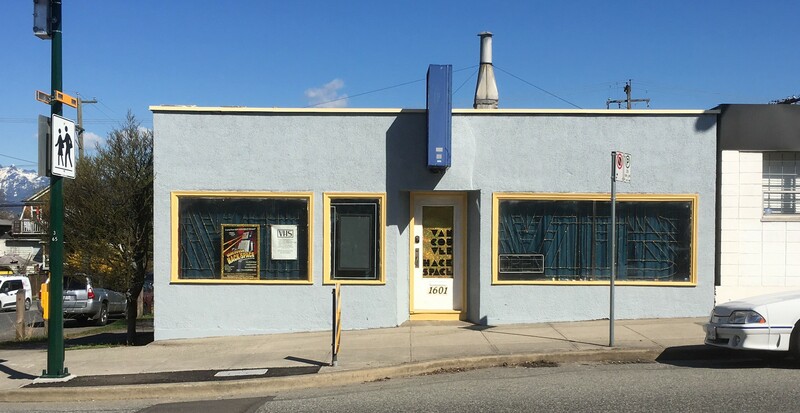 We're located at 1601 Venables St., at the corner of Woodland Drive, 2 blocks West of Commercial Drive. The front door is normally locked to the public, but keyholders voluntarily open the space to other members. Our open house nights are always on Tuesdays 7:30-10:30pm, where we welcome the community to come down, say hi, and work on a project. Take the #22 from Knight St. There is free street parking on Woodland drive and temporary parking in the alleyway behind VHS. We will have bike racks out front for locking up Soon™. In the mean time, there are suitable poles and trees nearby. No bike shed. Our bay doors at the back are large and wheelchair accessible, though our front door and side door are not. To see if VHS is open right now, check Is VHS Open?